Teddico/BWF Blank Cover, Weatherproof, 4-9/16 in Length, 2-13/16 in Width, 1 Gangs, 17.2 cu-in Capacity, Stamped Steel, White, Powder Coated, Includes: Gasket and Screws, cULus Listed Teddico/BWF Gasket, Round, Universal, Black Outdoor use, rugged metallic construction. Powder coat finish. Scratch resistant. Includes installation hardware, gasket, and multi-lingual instructions. C/UL/US UL Listed. NEMA 3R rated. Teddico/BWF Blank Cover, 3-IN-1, Round, 4-1/4 in Diameter, Stamped Aluminum, Gray, Powder Coated, Includes: Gasket and Screws, UL Listed, CSA Certified, RoHS Compliant Teddico/BWF Blank Cover, Round, Weatherproof, 4 in Diameter, Stamped Aluminum, White, Powder Coated, Box Mounting, NEMA 3R, Includes: Gasket and Screws, UL Listed, CSA Certified, For Bug Zappers, Holiday Lighting, Low Voltage Lighting, Soda Machines, Portable Spas, Engine Block Heater and Irrigation Pond Pumps Outdoor use, rugged metallic construction. Powder coat finish. Scratch resistant. Includes installation hardware, gasket, and multi-lingual instructions. C/UL/US UL Listed. NEMA 3R rated. Outdoor use, rugged metallic construction. Powder coat finish. Scratch resistant. Includes installation hardware, gasket, and multi-lingual instructions. C/UL/US UL Listed. NEMA 3R rated. Outdoor use, rugged metallic construction. Powder coat finish. Scratch resistant. Includes installation hardware, gasket, and multi-lingual instructions. C/UL/US UL Listed. NEMA 3R rated. 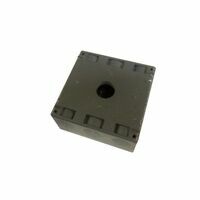 Rectangular replacement gaskets for weatherproof covers and lamp holders. Each gasket has cut outs for a toggle switch, duplex receptacle and 1.406" diameter round receptacle. Remove the cut outs for the duplex and round receptacles for a GFCI receptacle opening. Teddico/BWF Ceiling Outlet Cover, Round, Weatherproof, 5 in Diameter, Stamped Aluminum, White, Powder Coated, Box Mounting, NEMA 3R, Includes: Mounting Screws, UL Listed, CSA Certified, Fits 3 in Outlet Box, For Bug Zappers, Holiday Lighting, Low Voltage Lighting, Soda Machines, Portable Spas, Engine Block Heater and Irrigation Pond Pumps Teddico/BWF Ceiling Outlet Cover, Round, Weatherproof, 5 in Diameter, Stamped Aluminum, White, Powder Coated, Box Mounting, NEMA 3R, Includes: Mounting Screws, UL Listed, CSA Certified, Fits 3 in Outlet Box, For Bug Zappers, Holiday Lighting, Low Voltage Lighting, Soda Machines, Portable Spas, Engine Block Heater and Irrigation Pond Pumps For use with weatherproof boxes, extension adapters, cluster covers and round splice boxes to seal off unused outlets. Teddico/BWF Blank Cover, Weatherproof, 2 Gangs, 54 cu-in Capacity, Stamped Steel, Bronze, Powder Coated, Includes: Gasket and Screws Teddico/BWF Blank Cover, Weatherproof, 2 Gangs, 54 cu-in Capacity, Stamped Steel, White, Powder Coated, Includes: Gasket and Screws For use whenever weatherproof protection is required for a weatherproof box. Rugged die cast construction. Powder coat finish provides scratch resistance. Includes gasket and mounting hardware. Multi-lingual instructions in each package. UL Listed, NEMA 3R Rated. 4-1/2" x 4-1/2". Teddico/BWF Lampholder Cover, Round, Weatherproof, 4-1/2 in Diameter, 2 Outlets, Die Cast Metal, Gray, Powder Coated, Box Mounting, NEMA 3R, Includes: Gasket and Screws, UL Listed, CSA Certified, Fits 2-1/2 in Outlet Box, For Bug Zappers, Holiday Lighting, Low Voltage Lighting, Soda Machines, Portable Spas For use whenever weatherproof protection is required for a weatherproof box. Rugged die cast construction. Powder coat finish provides scratch resistance. Includes gasket and mounting hardware. Multi-lingual instructions in each package. UL Listed, NEMA 3R Rated. 4-1/2" x 4-1/2". For wet locations. Gasket, screws and plugs included. 4" cluster cover. Use 75-150 watt maximum, Die cast zinc. One 1/2" NPT hole. UL Listed. Tough plastic construction, resistant to high impact and sunlight. Non-corrosive and non-conductive. Gasket provided seals both device openings and edges. Self closing cover. Vertical only. UL Listed for wet locations with cover closed. For wet locations. Gasket, screws and plugs included. Use 75-150 watt maximum, Par-38 lamps. Die cast zinc, powder coat finish provides maximum weatherability and scratch resistance. Includes installation hardware, gasket, and multi-lingual instructions. One 1/2" NPT hole. Underwriters Recognized Component CSA C22.2 No. 18 NEMA 3R Rated. Horizontal device mount. Weatherproof covers for protection of outdoor receptacles. State-of-the-art powder coat finish provides maximum weatherability and scratch resistance. Self-closing lids assure weatherproof protection when the receptacle is not in use. Includes installation hardware, gasket, and multi-lingual instructions. Size: 4-1/2" x 2-3/4". UL 514-A listed, File E195978 CSA C22.2 No. 18 NEMA 3R Rated. Teddico/BWF Electrical Outlet Box, Weatherproof, Series: B5 Series, 3 Outlets, 1 Gangs, 3-1/2 in Knockout, 1/2 in Hub, 4-9/16 in Length, 2-13/16 in Width, 2 in Depth, 18.3 cu-in Capacity, Die Cast Metal, White, Powder Coated, Includes: Closure Plugs, Ground Screw and Mounting Lugs, UL Listed, NEC, CSA Certified, For Branch Circuit Wiring in Wet For wet locations. Gasket, screws and plugs included. Use 75-150 watt maximum, Par-38 lamps. Die cast zinc, powder coat finish provides maximum weatherability and scratch resistance. Includes installation hardware, gasket, and multi-lingual instructions. One 1/2" NPT hole. Underwriters Recognized Component CSA C22.2 No. 18 NEMA 3R Rated. For wet locations. Gasket, screws and plugs included. Use 75-150 watt maximum, Par-38 lamps. Die cast zinc, powder coat finish provides maximum weatherability and scratch resistance. Includes installation hardware, gasket, and multi-lingual instructions. One 1/2" NPT hole. Underwriters Recognized Component CSA C22.2 No. 18 NEMA 3R Rated. Teddico/BWF Floodlight Lamp Holder, 150 W Lamp, Incandescent Lamp, Die Cast, White, Includes: Porcelain Socket and Internal Gasket, 86 Unit Cubic, For Exterior or Interior Lighting and For Safety and Security, Light Walkways, Driveways and Doorways For wet locations. Gasket, screws and plugs included. 4" cluster cover. Die cast zinc. Three 1/2" NPT holes. UL Listed. Includes installation hardware, gasket, and multi-lingual instructions. 3 hole covers are supplied with two closure plugs. Die cast zinc construction. Three 1/2" NPT holes. UR - Underwrites recognized component CSA C22.2 No. 18 compliant. For wet locations. Gasket, screws and plugs included. 4" cluster cover. Use 75-150 watt maximum, Die cast zinc. One 1/2" NPT hole. UL Listed. Includes installation hardware, gasket, and multi-lingual instructions. 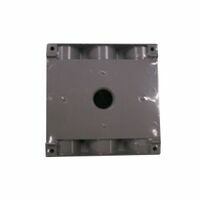 3 hole covers are supplied with two closure plugs. Die cast zinc construction. Three 1/2" NPT holes. UR - Underwrites recognized component CSA C22.2 No. 18 compliant. For wet locations. Gasket, screws and plugs included. 4" cluster cover. Die cast zinc. Three 1/2" NPT holes. UL Listed. Includes installation hardware, gasket, and multi-lingual instructions. 3 hole covers are supplied with two closure plugs. Die cast zinc construction. Three 1/2" NPT holes. UR - Underwrites recognized component CSA C22.2 No. 18 compliant. For use in wet, damp or dry locations. Three 1/2" threaded outlets. 2" deep with lugs. May be used as a weatherproof junction box, or as a housing for receptacles, switches, and GFCIs. Powder coat finish. Eight box mounting options with detachable lugs provided. Includes two closure plugs. Ground screw installed. Multi-lingual instructions. Internal threads and hubs comply with NEMA requirements. Hubs accept all threaded fittings and threaded conduit. Die cast aluminum construction. 18.3 cubic inch capacity. 2" depth x 4-1/2" length x 2-3/4" width. UL Listed. NEMA 3R rated. For wet locations. Gasket, screws and plugs included. 4" cluster cover. Use 75-150 watt maximum, Die cast zinc. One 1/2" NPT hole. UL Listed. Teddico/BWF Lampholder Cover, Raised, Weatherproof, 2-7/8 in Length, 1-1/16 in Width, 4-1/2 in Depth, 1 Gangs, 3 Outlets, Die Cast Metal, White, Box Mounting, NEMA 3R, Includes: Gasket, Screws and Closure Plugs, UL Listed, CSA Certified, 3-1/2 in Outlet, 1/2 in Hole Diameter, For Bug Zappers, Holiday Lighting, Low Voltage Lighting, Soda Machines Die cast zinc with porcelain socket. For wet locations. Use 75-150 watt maximum, Par-38 lamps. Includes gaskets and locknuts. UL Listed. Horizontal device mount. Weatherproof covers for protection of outdoor receptacles. State-of-the-art powder coat finish provides maximum weatherability and scratch resistance. Self-closing lids assure weatherproof protection when the receptacle is not in use. Includes installation hardware, gasket, and multi-lingual instructions. Size: 4-1/2" x 2-3/4". UL 514-A listed, File E195978 CSA C22.2 No. 18 NEMA 3R Rated. Horizontal device mount. Weatherproof covers for protection of outdoor receptacles. State-of-the-art powder coat finish provides maximum weatherability and scratch resistance. Self-closing lids assure weatherproof protection when the receptacle is not in use. Includes installation hardware, gasket, and multi-lingual instructions. Size: 4-1/2" x 2-3/4". UL 514-A listed, File E195978 CSA C22.2 No. 18 NEMA 3R Rated. Tough plastic construction, resistant to high impact and sunlight. Non-metallic, non-corrosive and non-conductive. Gasket provided seals both device openings and edges. UL Listed for damp locations. Stay open lids. Size 2-3/4" x 4-1/2". For wet locations. Gasket, screws and plugs included. 4" cluster cover. Die cast zinc. Three 1/2" NPT holes. UL Listed. Die cast zinc with porcelain socket. For wet locations. Use 75-150 watt maximum, Par-38 lamps. Includes gaskets and locknuts. UL Listed. Die cast zinc with porcelain socket. For wet locations. Use 75-150 watt maximum, Par-38 lamps. Includes gaskets and locknuts. UL Listed. Resistant to high impact and sunlight. Non-metallic, non-corrosive and non-conductive. Gasket provided seals both device openings and edges. Lid stays open in use. UL Listed for damp locations. State-of-the-art powder coat finish provides maximum weatherability and scratch resistance. Self-closing lids assure weatherproof protection when the receptacle is not in use. Installation hardware, gasket, multi-lingual instructions included. For single 1.406" diameter receptacle. UL Listed for wet location with cover closed. With powder coat finish for weatherability and scratch resistance. For use whenever weatherproof protection is required for an outdoor receptacle. Self-closing lid for weatherproof protection when the receptacle is not in use. Includes installation hardware, gasket, and multi-lingual instructions. Size: 4-1/2" length x 2-3/4" width x 1.406" depth. UL Listed, Meets Standard 514A, C22.2 No. 18, (5103 series) NEMA 3R rated. Horizontal device mount. Weatherproof covers for protection of outdoor receptacles. State-of-the-art powder coat finish provides maximum weatherability and scratch resistance. Self-closing lids assure weatherproof protection when the receptacle is not in use. Includes installation hardware, gasket, and multi-lingual instructions. Size: 4-1/2" x 2-3/4". UL 514-A listed, File E195978 CSA C22.2 No. 18 NEMA 3R Rated. Includes installation hardware, gasket, and multi-lingual instructions. 3 hole covers are supplied with two closure plugs. Die cast zinc construction. Three 1/2" NPT holes. UR - Underwrites recognized component CSA C22.2 No. 18 compliant. For wet locations. Gasket, screws and plugs included. 4" cluster cover. Die cast zinc. Three 1/2" NPT holes. UL Listed. For use in wet, damp or dry locations. Three 1/2" threaded outlets. 2" deep with lugs. May be used as a weatherproof junction box, or as a housing for receptacles, switches, and GFCIs. Powder coat finish. Eight box mounting options with detachable lugs provided. Includes two closure plugs. Ground screw installed. Multi-lingual instructions. Internal threads and hubs comply with NEMA requirements. Hubs accept all threaded fittings and threaded conduit. Die cast aluminum construction. 18.3 cubic inch capacity. 2" depth x 4-1/2" length x 2-3/4" width. UL Listed. NEMA 3R rated. Includes installation hardware, gasket, and multi-lingual instructions. 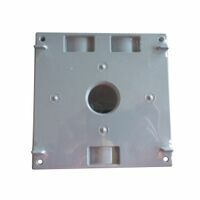 3 hole covers are supplied with two closure plugs. Die cast zinc construction. Three 1/2" NPT holes. UR - Underwrites recognized component CSA C22.2 No. 18 compliant. For wet locations. Gasket, screws and plugs included. 4" cluster cover. Die cast zinc. Three 1/2" NPT holes. UL Listed. Horizontal device mount. Weatherproof covers for protection of outdoor receptacles. State-of-the-art powder coat finish provides maximum weatherability and scratch resistance. Self-closing lids assure weatherproof protection when the receptacle is not in use. Includes installation hardware, gasket, and multi-lingual instructions. Size: 4-1/2" x 2-3/4". UL 514-A listed, File E195978 CSA C22.2 No. 18 NEMA 3R Rated. With powder coat finish for weatherability and scratch resistance. For use whenever weatherproof protection is required for an outdoor receptacle. 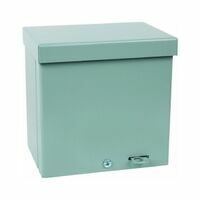 Self-closing lid for weatherproof protection when the receptacle is not in use. Includes installation hardware, gasket, and multi-lingual instructions. Size: 4-1/2" length x 2-3/4" width x 1.406" depth. UL Listed, Meets Standard 514A, C22.2 No. 18, (5103 series) NEMA 3R rated. Die cast zinc with porcelain socket. For wet locations. Use 75-150 watt maximum, Par-38 lamps. Includes gaskets and locknuts. UL Listed. Tough plastic construction, resistant to high impact and sunlight. Non-metallic, non-corrosive and non-conductive. Gasket provided seals both device openings and edges. UL Listed for damp locations. Stay open lids. Size 2-3/4" x 4-1/2". Used to provide additional capacity. Die cast aluminum construction. Installation hardware, gasket, and ground screw provided. 9.5 cubic inch capacity. 4-1/2" x 2-3/4" x 1" deep. UL Listed, CSA, NEMA 3R Rated. Resistant to high impact and sunlight. Non-metallic, non-corrosive and non-conductive. Gasket provided seals both device openings and edges. Lid stays open in use. UL Listed for damp locations. For use in wet, damp or dry locations. Three 1/2" threaded outlets. 2" deep with lugs. May be used as a weatherproof junction box, or as a housing for receptacles, switches, and GFCIs. Powder coat finish. Eight box mounting options with detachable lugs provided. Includes two closure plugs. Ground screw installed. Multi-lingual instructions. Internal threads and hubs comply with NEMA requirements. Hubs accept all threaded fittings and threaded conduit. Die cast aluminum construction. 18.3 cubic inch capacity. 2" depth x 4-1/2" length x 2-3/4" width. UL Listed. NEMA 3R rated. Die cast zinc with porcelain socket. For wet locations. Use 75-150 watt maximum, Par-38 lamps. Includes gaskets and locknuts. UL Listed. Die cast zinc with porcelain socket. For wet locations. Use 75-150 watt maximum, Par-38 lamps. Includes gaskets and locknuts. UL Listed. With lugs. Die cast aluminum. For use in branch circuit wiring in wet, damp, or dry locations. May be used as a weatherproof junction box, or as housing for receptacles, switches, and GFCI's. Eight box mounting options with detachable lugs provided. Three threaded 3/4" outlets. Powder coat finish. 18.3 cubic inch capacity. Two closure plugs included. Ground screws installed. Internal threads and hubs comply with NEMA requirements. Hubs accept all threaded fittings and threaded conduit. 2" depth x 4-1/2" length x 2-3/4" width. UL Listed. Includes installation hardware, gasket, and multi-lingual instructions. 3 hole covers are supplied with two closure plugs. Die cast zinc construction. Three 1/2" NPT holes. UR - Underwrites recognized component CSA C22.2 No. 18 compliant. Constructed of die-cast aluminum. For use in branch circuit wiring in wet, damp or dry locations. May be used as a weatherproof junction box or as a housing for receptacles, switches, and GFCIs. Reinforced connector outlets. Powder coat finish. Eight box mounting options with detachable lugs provided. Two closure plugs included. Ground screw installed. Four 1/2" threaded outlets. Complies with NEMA requirements. Hubs accept all threaded fittings and threaded conduit. Multi-lingual instructions. 2" depth. 18.3 cubic inch capacity. 4-1/2" length x 2-3/4" width. UL Listed. NEMA 3R rated. Weatherproof cover for single toggle switch applications. Vertical mount. UV resistant, suitable for outdoor use. Nonmetallic/noncorrosive, won't rust or fade, paintable. UL Marine Listed, CSA Certified. Teddico/BWF Electrical Outlet Box, Weatherproof, Series: B5 Series, 5 Outlets, 1 Gangs, 5-1/2 in Knockout, 1/2 in Hub, 4-9/16 in Length, 2-13/16 in Width, 2 in Depth, 18.3 cu-in Capacity, Die Cast Metal, Gray, Powder Coated, Includes: Closure Plugs, Ground Screw and Mounting Lugs, UL Listed, NEC, CSA Certified, For Branch Circuit Wiring in Wet Teddico/BWF Electrical Outlet Box, Weatherproof, Series: B75, 4 Outlets, 1 Gangs, 4-3/4 in Knockout, 3/4 in Hub, 4-9/16 in Length, 2-13/16 in Width, 2 in Depth, 18.3 cu-in Capacity, Die Cast Metal, Gray, Powder Coated, Includes: Closure Plugs, Ground Screw and Mounting Lugs, UL Listed, NEC, CSA Certified, For Branch Circuit Wiring in Wet Includes installation hardware, gasket, and multi-lingual instructions. Weatherproof protection for outdoor receptacle. Powder coat finish for weather. Scratch resistance. Self-closing lid protects receptacle when not in use. C/UL/US NEMA 3R rated. Shrink wrapped. For use in wet, damp or dry locations. Three 1/2" threaded outlets. 2" deep with lugs. May be used as a weatherproof junction box, or as a housing for receptacles, switches, and GFCIs. Powder coat finish. Eight box mounting options with detachable lugs provided. Includes two closure plugs. Ground screw installed. Multi-lingual instructions. Internal threads and hubs comply with NEMA requirements. Hubs accept all threaded fittings and threaded conduit. Die cast aluminum construction. 18.3 cubic inch capacity. 2" depth x 4-1/2" length x 2-3/4" width. UL Listed. NEMA 3R rated. Includes installation hardware, gasket, and multi-lingual instructions. Weatherproof protection for outdoor receptacle. Powder coat finish for weather. Scratch resistance. Self-closing lid protects receptacle when not in use. C/UL/US NEMA 3R rated. Shrink wrapped. For use in wet, damp or dry locations. Three 1/2" threaded outlets. 2" deep with lugs. May be used as a weatherproof junction box, or as a housing for receptacles, switches, and GFCIs. Powder coat finish. Eight box mounting options with detachable lugs provided. Includes two closure plugs. Ground screw installed. Multi-lingual instructions. Internal threads and hubs comply with NEMA requirements. Hubs accept all threaded fittings and threaded conduit. Die cast aluminum construction. 18.3 cubic inch capacity. 2" depth x 4-1/2" length x 2-3/4" width. UL Listed. NEMA 3R rated. Teddico/BWF GFCI Cover, Rectangular, Self-Closing, Weatherproof, 4-9/16 in Length, 2-13/16 in Width, 1 Gangs, Die Cast Metal, White, Powder Coated, Vertical Mounting, NEMA 3R, Includes: Gasket and Screws, UL Listed, CSA Certified, RoHS Compliant, For GFCI Devices Teddico/BWF Toggle Switch Cover, Rectangular, Weatherproof, 4-9/16 in Length, 2-13/16 in Width, 1 Gangs, Die Cast Metal, Gray, Powder Coated, Box, Vertical Mounting, Includes: Gasket and Screws, UL Listed, CSA Certified, RoHS Compliant, 15 A Single Pole Non-conductive, corrosion resistant, and paintable for safe installation and operation in wet or damp locations. NEMA 3R rated and UL Listed. For outdoor horizontal use. Powder coat finish. Scratch resistant. Self-closing lid assures protection when receptacle is not in use. Includes installation hardware, gasket, and multi-lingual instructions. UL 514-A listed, File E 195978 C/UL CSA C22.2 No. 18 NEMA 3R rated. Constructed of die-cast aluminum. For use in branch circuit wiring in wet, damp or dry locations. May be used as a weatherproof junction box or as a housing for receptacles, switches, and GFCIs. Reinforced connector outlets. Powder coat finish. Eight box mounting options with detachable lugs provided. Two closure plugs included. Ground screw installed. Four 1/2" threaded outlets. Complies with NEMA requirements. Hubs accept all threaded fittings and threaded conduit. Multi-lingual instructions. 2" depth. 18.3 cubic inch capacity. 4-1/2" length x 2-3/4" width. UL Listed. NEMA 3R rated. For use whenever weatherproof protection is required for an "on/off" type switch. Powder coat finish. Supplied with a switch unassembled to the cover - no need to purchase separate components. Includes installation hardware and multi-lingual instructions. Size 4-1/2" length x 2-3/4" width. UL Listed, CSA, NEMA 3R Rated. Teddico/BWF Power Outlet Cover, Rectangular, Self-Closing, Weatherproof, 4-9/16 in Length, 2-13/16 in Width, 1 Gangs, 1 Outlets, Die Cast Metal, Gray, Powder Coated, Vertical, Screw Mounting, Includes: Gasket and Screws, UL Listed, CSA Certified, RoHS Compliant, 2-1/8 in Opening, For 20/30/50 A Single Receptacle Teddico/BWF Lamp Holder, Single, Knuckle Mounting, Die Cast Metal, Gray, Powder Coated, Includes: Porcelain Socket, Gaskets and Screws, For Exterior/Interior Lighting, Safety and Security, Light Walkways, Driveways and Doorways For outdoor horizontal use. Powder coat finish. Scratch resistant. Self-closing lid assures protection when receptacle is not in use. Includes installation hardware, gasket, and multi-lingual instructions. UL 514-A listed, File E 195978 C/UL CSA C22.2 No. 18 NEMA 3R rated. For outdoor horizontal use. Powder coat finish. Scratch resistant. Self-closing lid assures protection when receptacle is not in use. Includes installation hardware, gasket, and multi-lingual instructions. UL 514-A listed, File E 195978 C/UL CSA C22.2 No. 18 NEMA 3R rated. For outdoor horizontal use. Powder coat finish. Scratch resistant. Self-closing lid assures protection when receptacle is not in use. Includes installation hardware, gasket, and multi-lingual instructions. UL 514-A listed, File E 195978 C/UL CSA C22.2 No. 18 NEMA 3R rated. With lugs. Die cast aluminum. For use in branch circuit wiring in wet, damp, or dry locations. May be used as a weatherproof junction box, or as housing for receptacles, switches, and GFCI's. Eight box mounting options with detachable lugs provided. Powder coat finish. 16.5 cubic inch capacity. Two closure plugs included. Ground screw installed. Internal threads and hubs comply with NEMA requirements. Hubs accept all threaded fittings and threaded conduit. 2" depth x 4-1/2" length x 2-3/4" width. UL Listed. Shrink wrapped. Constructed of die-cast aluminum. For use in branch circuit wiring in wet, damp or dry locations. May be used as a weatherproof junction box or as a housing for receptacles, switches, and GFCIs. Reinforced connector outlets. Powder coat finish. Eight box mounting options with detachable lugs provided. Two closure plugs included. Ground screw installed. Four 1/2" threaded outlets. Complies with NEMA requirements. Hubs accept all threaded fittings and threaded conduit. Multi-lingual instructions. 2" depth. 18.3 cubic inch capacity. 4-1/2" length x 2-3/4" width. UL Listed. NEMA 3R rated. For use whenever weatherproof protection is required for an "on/off" type switch. Powder coat finish. Supplied with a switch unassembled to the cover - no need to purchase separate components. Includes installation hardware and multi-lingual instructions. Size 4-1/2" length x 2-3/4" width. UL Listed, CSA, NEMA 3R Rated. For use in branch circuit wiring in wet, damp, or dry locations. Designed for use as a weatherproof junction box, and used with Bell round cluster covers and round lampholder combinations. Die cast aluminum construction. Powder coat finish. Reinforced connector outlets. Cast-in mounting lugs, four closure plugs included, and installed ground screw. 16.1 cubic inch capacity. Six 10-24 tapped holes. 4" diameter x 1-1/2" depth. UL Listed. With lugs. Die cast aluminum. For use in branch circuit wiring in wet, damp, or dry locations. May be used as a weatherproof junction box, or as housing for receptacles, switches, and GFCI's. Eight box mounting options with detachable lugs provided. Three threaded 3/4" outlets. Powder coat finish. 18.3 cubic inch capacity. Two closure plugs included. Ground screws installed. Internal threads and hubs comply with NEMA requirements. Hubs accept all threaded fittings and threaded conduit. 2" depth x 4-1/2" length x 2-3/4" width. UL Listed. For outdoor horizontal use. Powder coat finish. Scratch resistant. Self-closing lid assures protection when receptacle is not in use. Includes installation hardware, gasket, and multi-lingual instructions. UL 514-A listed, File E 195978 C/UL CSA C22.2 No. 18 NEMA 3R rated. Waterproof protection for outside receptacle. Metallic construction, powder coat finish. Scratch resistant. Self-closing lid when not in use. Includes installation hardware, gasket, and multi-lingual instructions. 4-1/2" length x 2-3/4" width. C/UL/US UL 514-A listed, File E195978 (5132-5146) CSA C22.2 No. 18 (5132-5146) NEMA 3R rated. Teddico/BWF Electrical Outlet Box, Weatherproof, Series: RB, 5 Outlets, 5-1/2 in Knockout, 1/2 in Hub, 4-9/16 in Length, 4-5/8 in Width, 2 in Depth, Round Shape, 16.5 cu-in Capacity, Die Cast Metal, Gray, Powder Coated, Includes: Closure Plugs, Ground Screw and Mounting Lugs, UL Listed, NEC, CSA Certified, For Branch Circuit Wiring in Wet Teddico/BWF Electrical Outlet Box, Weatherproof, Series: RB, 5 Outlets, 5-1/2 in Knockout, 1/2 in Hub, 4-9/16 in Length, 4-5/8 in Width, 2 in Depth, Round Shape, 16.5 cu-in Capacity, Die Cast Metal, White, Powder Coated, Includes: Closure Plugs, Ground Screw and Mounting Lugs, UL Listed, NEC, CSA Certified, For Branch Circuit Wiring in Wet For outdoor horizontal use. Powder coat finish. Scratch resistant. Self-closing lid assures protection when receptacle is not in use. Includes installation hardware, gasket, and multi-lingual instructions. UL 514-A listed, File E 195978 C/UL CSA C22.2 No. 18 NEMA 3R rated. Teddico/BWF Lamp Holder, Single, Knuckle Mounting, Die Cast Metal, Bronze, Powder Coated, Includes: Porcelain Socket, Gaskets and Screws, For Exterior/Interior Lighting, Safety and Security, Light Walkways, Driveways and Doorways Teddico/BWF Lamp Holder, Single, Knuckle Mounting, Die Cast Metal, White, Powder Coated, Includes: Porcelain Socket, Gaskets and Screws, For Exterior/Interior Lighting, Safety and Security, Light Walkways, Driveways and Doorways For 50 amp twist lock single receptacles under 2.250" diameter. For exposed applications. Will not rust or corrode. Gaskets and screws included. UL Listed. Non-conductive, corrosion resistant, and paintable for safe installation and operation in wet or damp locations. NEMA 3R rated and UL Listed. 2.63" high x 1.31" wide opening. Non-conductive. Suitable for wet locations. Gaskets and screws included. UL Listed. Non-conductive, corrosion resistant, and paintable for safe installation and operation in wet or damp locations. NEMA 3R rated and UL Listed. Weatherproof protection for an "on-off" type switch. Vertical, mounted to device. Rugged die cast construction, powder coat finish. Self-closing lid assures weatherproof protection when not in use. Supplied with a switch - no need to purchase separate components. Switch is unassembled to the cover. UL, CSA and NEMA 3R rated. Shrink wrapped. For use in branch circuit wiring in wet, damp, or dry locations. Designed for use as a weatherproof junction box, and used with Bell round cluster covers and round lampholder combinations. Die cast aluminum construction. Powder coat finish. Reinforced connector outlets. Cast-in mounting lugs, four closure plugs included, and installed ground screw. 16.1 cubic inch capacity. Six 10-24 tapped holes. 4" diameter x 1-1/2" depth. UL Listed. Plastic, impact and sunlight resistant. Gaskets provided to seal cover edges as well as device openings. Self closing cover. Stainless steel mounting screws furnished. Vertical, flush or surface mount. UL Listed. For 15 amp or other single receptacles under 1.375" diameter. Non-conductive, corrosion resistant, and paintable for safe installation and operation in wet or damp locations. NEMA 3R rated and UL Listed. Plastic, impact and sunlight resistant. Gaskets provided to seal cover edges as well as device openings. Self closing cover. Stainless steel mounting screws furnished. Vertical, flush or surface mount. UL Listed. For GFCI/Decorator receptacle used in wet locations. Gaskets provided to seal cover edges as well as device openings. Stainless steel mounting screws included. Horizontal flush or surface mount. UL Listed. With lugs. Die cast aluminum. For use in branch circuit wiring in wet, damp, or dry locations. May be used as a weatherproof junction box, or as housing for receptacles, switches, and GFCIs. 5 reinforced 1/2" threaded connector outlets. Powder coat finish. Two closure plugs included. Ground screws installed. Internal threads and hubs comply with NEMA requirements. 2" depth x 4-1/2" length x 2-3/4" width. 18.3 cubic inch capacity. UL Listed. With lugs. Die cast aluminum. For use in branch circuit wiring in wet, damp, or dry locations. May be used as a weatherproof junction box, or as housing for receptacles, switches, and GFCI's. Eight box mounting options with detachable lugs provided. Five 3/4" threaded outlets. Powder coat finish. 18.3 cubic inch capacity. Two closure plugs included. Ground screws installed. Internal threads and hubs comply with NEMA requirements. Hubs accept all threaded fittings and threaded conduit. 2" depth x 4-1/2" length x 2-3/4" width. UL Listed, CSA Approved and NEMA 3R Rated. For use in branch circuit wiring in wet, damp, or dry locations. Designed for use as a weatherproof junction box, and used with Bell round cluster covers and round lampholder combinations. Die cast aluminum construction. Powder coat finish. Reinforced connector outlets. Cast-in mounting lugs, four closure plugs included, and installed ground screw. 16.1 cubic inch capacity. Six 10-24 tapped holes. 4" diameter x 1-1/2" depth. UL Listed. Teddico/BWF Toggle Switch Cover, Rectangular, Weatherproof, 4-9/16 in Length, 2-13/16 in Width, 1 Gangs, Die Cast Metal, Gray, Powder Coated, Box, Vertical Mounting, Includes: Gasket and Screws, UL Listed, CSA Certified, RoHS Compliant, 15 A/3-Way Switch Teddico/BWF Lamp Holder, Single, Knuckle Mounting, Die Cast Metal, Gray, Powder Coated, Includes: Porcelain Socket, Gaskets and Screws, For Exterior/Interior Lighting, Safety and Security, Light Walkways, Driveways and Doorways Used where weatherproof protection is required for an outdoor receptacle. Self-closing lids. Powder coat finish. Size 4-1/2" width x 2-3/4" length. Includes gasket and mounting hardware. UL Listed, NEMA 3R Rated. Die cast zinc round 4" cover and lampholder combination. Powder coat finish, scratch-resistant. For wet locations. Includes installation hardware, gasket, and multi-lingual instructions. Uses 75-150 watt maximum, Par-38 lamps, not included. UL Listed 1598 C/UL. Weather resistant cover for double toggle switch applications. Vertical mount. UV resistant, suitable for outdoor use. Nonmetallic/noncorrosive, won't rust or fade, paintable. UL Marine Listed, CSA Certified. For use whenever weatherproof protection is required for an "on/off" type switch. Powder coat finish. Supplied with a switch unassembled to the cover - no need to purchase separate components. Includes installation hardware and multi-lingual instructions. Size 4-1/2" length x 2-3/4" width. UL Listed, CSA, NEMA 3R Rated. For use in branch circuit wiring in wet, damp, or dry locations. Designed for use as a weatherproof junction box, and used with Bell round cluster covers and round lampholder combinations. Die cast aluminum construction. Powder coat finish. Reinforced connector outlets. Cast-in mounting lugs, four closure plugs included, and installed ground screw. 4" diameter x 1-1/2" depth. UL Listed. NEMA 3R Rated. For use in branch circuit wiring in wet, damp, or dry locations. Designed for use as a weatherproof junction box, and used with Bell round cluster covers and round lampholder combinations. Die cast aluminum construction. Powder coat finish. Reinforced connector outlets. Cast-in mounting lugs, four closure plugs included, and installed ground screw. 16.1 cubic inch capacity. Six 10-24 tapped holes. 4" diameter x 1-1/2" depth. UL Listed. For use in branch circuit wiring in wet, damp, or dry locations. Designed for use as a weatherproof junction box, and used with Bell round cluster covers and round lampholder combinations. Die cast aluminum construction. Powder coat finish. Reinforced connector outlets. Cast-in mounting lugs, four closure plugs included, and installed ground screw. 16.1 cubic inch capacity. Six 10-24 tapped holes. 4" diameter x 1-1/2" depth. UL Listed. Teddico/BWF Receptacle Cover, Self-Closing, Weatherproof, 4-9/16 in Length, 4-9/16 in Width, 2 Gangs, 65 cu-in Capacity, Die Cast Metal, White, Powder Coated, Includes: Gasket and Screws, For 2 Duplex Receptacles, Switches or Combination Devices Die cast zinc round 4" cover and lampholder combination. Powder coat finish, scratch-resistant. For wet locations. Includes installation hardware, gasket, and multi-lingual instructions. Uses 75-150 watt maximum, Par-38 lamps, not included. UL Listed 1598 C/UL. Corrosion resistant materials suitable for exposure to weather. Gaskets provided to seal cover edges and openings. Corrosion resistant mounting screws included. Mount on flush or surface single gang boxes. UL Listed. 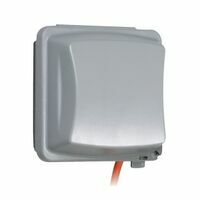 For weatherproof 30-50 amp receptacles and wet locations. 2.625" diameter. Die cast aluminum construction, powder coat finish. Scratch resistant. Self-closing lid assures protection when the receptacle is not in use. Padlockable. May be mounted to box or device. Includes installation hardware, gasket, and multi-lingual instructions. UL listed 514-A , File E 195978 CSA C22.2 No. 18 NEMA 3R rated. Shrink wrapped. Die cast zinc round 4" cover and lampholder combination. Powder coat finish, scratch-resistant. For wet locations. Includes installation hardware, gasket, and multi-lingual instructions. Uses 75-150 watt maximum, Par-38 lamps, not included. UL Listed 1598 C/UL. Die cast zinc round 4" cover and lampholder combination. Powder coat finish, scratch-resistant. For wet locations. Includes installation hardware, gasket, and multi-lingual instructions. Uses 75-150 watt maximum, Par-38 lamps, not included. UL Listed 1598 C/UL. Thomas & Betts Electrical Box Cover, Non-Metallic, While-in-Use, Weatherproof, 6-1/2 in Length, 3-25/64 in Width, 2-21/64 in Depth, 1 Gangs, Polycarbonate, Clear, Horizontal, Vertical, Box, Device Mounting, cUL Listed E42728, CSA Certified, For Outdoor Use and Wet or Damp Locations Electrostatically painted with a baked, weather-resistant powder finish. Accept single gang weatherproof covers and standard FS covers. Mounting lugs provide strength and durability on any mounting surface. Raised knockout studs on back of box provide alternative means for wall mounting. Strike desired studs with sharp hammer blow for clean mounting holes. Ground screw hole located inside back wall of box. Threaded outlets for conduit and connectors. Two closure plugs and mounting lugs furnished. Three holes, one at each end and one on the back. 2" depth x 2.812" width x 4.562" length. UL Listed. Carded. Die cast zinc with round 4" cover and porcelain sockets. For wet locations. Use 75-150 watt maximum, Par-38 lamps, not included. Includes multi-lingual instructions, gasket, screws and plugs. UL Listed. For 30-50 amp receptacles, 2.150" diameter. Die cast aluminum construction, powder coat finish. Scratch resistant. Self-closing lid assures protection when not in use. Padlockable. May be mounted to box or device. Includes installation hardware, gasket, and multi-lingual instructions. UL listed NEMA 3R rated. Die cast zinc with round 4" cover and porcelain sockets. For wet locations. Use 75-150 watt maximum, Par-38 lamps, not included. Includes multi-lingual instructions, gasket, screws and plugs. UL Listed. Die cast zinc with round 4" cover and porcelain sockets. For wet locations. Use 75-150 watt maximum, Par-38 lamps, not included. Includes multi-lingual instructions, gasket, screws and plugs. UL Listed. Waterproof protection for outside receptacle. Self-closing lids. Installation hardware, gasket, and multi-lingual instructions included. Size: 4-1/2" width x 4-1/2" length. C/UL/US UL 514-A listed, CSA and NEMA 3R rated. Die cast zinc with rectangular cover and porcelain sockets. For wet locations. Use 75-150 watt maximum, Par-38 lamps, not included. Includes gasket, screws and plugs. UL Listed. Die cast zinc with rectangular cover and porcelain sockets. For wet locations. Use 75-150 watt maximum, Par-38 lamps, not included. Includes gasket, screws and plugs. UL Listed. Die cast zinc with round 4" cover and porcelain sockets. For wet locations. Use 75-150 watt maximum, Par-38 lamps, not included. Includes multi-lingual instructions, gasket, screws and plugs. UL Listed. Die cast zinc with round 4" cover and porcelain sockets. For wet locations. Use 75-150 watt maximum, Par-38 lamps, not included. Includes multi-lingual instructions, gasket, screws and plugs. UL Listed. Waterproof protection for outside receptacle. Self-closing lids. Installation hardware, gasket, and multi-lingual instructions included. Size: 4-1/2" width x 4-1/2" length. C/UL/US UL 514-A listed, CSA and NEMA 3R rated. For two gang duplex receptacles and weatherproof toggle switch applications. With lugs. Die cast aluminum. For use in branch circuit wiring in wet, damp, or dry locations. May be used as a weatherproof junction box or as housing for receptacles, switches and GFCI's. Eight box mounting options with detachable lugs provided. 2" deep, three 3/4" threaded outlets. 32 cubic inch capacity. Powder coat finish. Two closure plugs included. Ground screw installed. Internal threads and hubs comply with NEMA requirements. Hubs accept all threaded fittings and threaded conduit. UL Listed, CSA Approved and NEMA 3R Rated. For use in branch circuit wiring in wet, damp, or dry locations. Can be used as a weatherproof junction box, or as a housing for receptacles, switches and GFCIs. Die cast aluminum construction. Reinforced connector outlets. Powder coat finish. Eight box mounting options with detachable lugs provided. Five 1/2" threaded outlets. 31.0 cubic inch capacity. Two closure plugs included. Ground screw installed. Internal threads and hubs comply with NEMA requirements. Hubs accept all threaded fittings and threaded conduit. 2" depth x 4-1/2" length x 4-9/16" width. Multi-lingual instructions. UL Listed. NEMA 3R Rated. Used to provide additional capacity needed for NEC box fill requirements. Die cast aluminum construction. 6 threaded 1/2" outlets. Installation hardware gasket and 1/2" closure plugs included. Ground screw is provided. Internal threads and hubs comply with NEMA requirements. Hubs accept all threaded 1/2" fittings and threaded conduit. 5-1/4" length x 3-1/2" width x 1-1/2" depth. UL Listed. NEMA 3R Rated. For outdoor GFCI receptacles and wet locations. Die cast aluminum construction, powder coat finish. Scratch resistant. Self-closing lid assures protection when not in use. Padlockable. May be mounted to box or device. Includes installation hardware, gasket, and multi-lingual instructions. 4-1/2" length x 2-3/4" width. UL listed 514-A , File E 195978 CSA C22.2 No. 18 NEMA 3R rated. Used to provide additional capacity. Die cast aluminum construction. Includes installation hardware, closure plugs, gasket, and multi-lingual instructions. Four 1/2" threaded outlets. Accepts all threaded 1/2" fittings and threaded conduit. 4" Round, 1-1/2" Deep. UL listed, CSA, NEMA 3R rated. Shrink wrapped. For outdoor GFCI receptacles and wet locations. Die cast aluminum construction, powder coat finish. Scratch resistant. Self-closing lid assures protection when not in use. Padlockable. May be mounted to box or device. Includes installation hardware, gasket, and multi-lingual instructions. 4-1/2" length x 2-3/4" width. UL listed 514-A , File E 195978 CSA C22.2 No. 18 NEMA 3R rated. Accepts GFCI, duplex, switch and up to 1-3/8" round devices. Nonconductive, noncorrosive, and impact resistant. Won't rust or fade. Scratch resistant. For use in wet/damp locations. Keyhole mounts, loosen the existing device screws and slide the cover over. Comes with adapter plates and pre-adhered gaskets. Wasp guard included to keep out unwanted pests. Lockable for security. UL Listed. Powder coat finish and scratch resistant. Weatherproof protection for outdoor receptacles. Self-closing lids assure weatherproof protection when the receptacle is not in use. Includes installation hardware, gasket, and multi-lingual instructions. 2 single, 1.406" diameter receptacle openings. C/UL/US UL 514-A listed, CSA C22.2 No. 18, NEMA 3R Rated. Shrink pack. With lugs. Die cast aluminum. For use in branch circuit wiring in wet, damp or dry locations. May be used as a weatherproof junction box, or as housing for receptacles, switches and GFCI's. Eight box mounting options with detachable lugs provided. Three 1/2" threaded outlets. Powder coat finish. 32 cubic inch capacity. Two closure plugs included. Ground screw installed. Internal threads and hubs comply with NEMA requirements. Hubs accept all threaded fittings and threaded conduit. 4-1/2" x 4-1/2" x 2" deep. UL Listed, CSA Approved and NEMA 3R Rated. For use in branch circuit wiring in wet, damp, or dry locations. 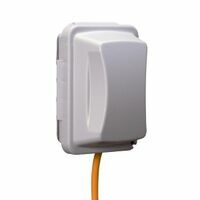 Can be used as a weatherproof junction box, or as a housing for receptacles, switches and GFCIs. Die cast aluminum construction. Reinforced connector outlets. Powder coat finish. Eight box mounting options with detachable lugs provided. Five 1/2" threaded outlets. 31.0 cubic inch capacity. Two closure plugs included. Ground screw installed. Internal threads and hubs comply with NEMA requirements. Hubs accept all threaded fittings and threaded conduit. 2" depth x 4-1/2" length x 4-9/16" width. Multi-lingual instructions. UL Listed. NEMA 3R Rated. For indoor or outdoor lighting. Die cast zinc construction. Powder coat finish. Scratch resistant. Locking swivel knuckle assures lamp positioning and directional aiming. Porcelain socket, inside gasket. 1/2" locknut. Multi-lingual instructions. UL Standard 1598 CSA certified C22.2 no. 18 compliant. Shrink wrapped. Electrostatically painted with a baked, weather-resistant powder finish. Accept single gang weatherproof covers and standard FS covers. 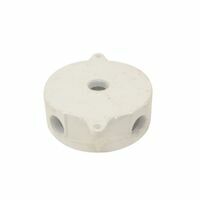 Mounting lugs provide strength and durability on any mounting surface. Raised knockout studs on back of box provide alternative means for wall mounting. Strike desired studs with sharp hammer blow for clean mounting holes. Ground screw hole located inside back wall of box. Threaded outlets for conduit and connectors. Two closure plugs and mounting lugs furnished. Three holes, one at each end and one on the back. 2" depth x 2.812" width x 4.562" length. UL Listed. Carded. For indoor or outdoor lighting. Die cast zinc construction. Powder coat finish. Scratch resistant. Locking swivel knuckle assures lamp positioning and directional aiming. Porcelain socket, inside gasket. 1/2" locknut. Multi-lingual instructions. UL Standard 1598 CSA certified C22.2 no. 18 compliant. Shrink wrapped. For use in branch circuit wiring in wet, damp, or dry locations. 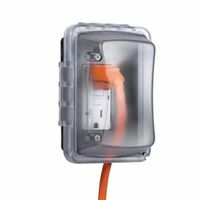 Can be used as a weatherproof junction box, or as a housing for receptacles, switches and GFCIs. Die cast aluminum construction. Reinforced connector outlets. Powder coat finish. Eight box mounting options with detachable lugs provided. Five 1/2" threaded outlets. 31.0 cubic inch capacity. Two closure plugs included. Ground screw installed. Internal threads and hubs comply with NEMA requirements. Hubs accept all threaded fittings and threaded conduit. 2" depth x 4-1/2" length x 4-9/16" width. Multi-lingual instructions. UL Listed. NEMA 3R Rated. Die cast zinc with round 4" cover and porcelain sockets. For wet locations. Use 75-150 watt maximum, Par-38 lamps, not included. Includes multi-lingual instructions, gasket, screws and plugs. UL Listed. Weatherproof 1-gang plastic cover with motor base inlet. UL Listed for wet locations with cover closed. Meets 2014 NEC 404.4. Ready for outdoor installation. Gasket seals both openings and edges. Horizontal mounting. 15A/125VAC, NEMA 5-15P. 4.75" x 2.95" x .75". cULus Listed. UV resistant polycarbonate back, see-through self closing cover and pre-mounted gasket protect against rain, sleet and snow without cracking or breaking. Non-corrosive and non-conductive. Snap-in inserts for flexibility. Moveable hinges mount either horizontally or vertically in vinyl, brick, stucco or concrete. Meets and exceeds UL outdoor low voltage landscape lighting requirements. Meets 1999 NEC Article 210-60 (b) for hotels and motels requiring covered receptacles behind beds, and 2002 NEC Article 406.8 (B) (1) for receptacles in damp or wet locations. Comes standard with three inserts (for a total of 16 different configurations): duplex, decorator and a toggle/five receptacle opening. Receptacle sizes are: 1.25" (31.75mm), 1.375" (34.925mm), 1.625" (41.275mm), 1.75" (44.45mm), and 2.125" (54.00mm). 3.25" deep x 6.085" x 4.446". UL and cUL listed, meets NEMA 3R requirements. Accepts GFCI, duplex, switch and up to 1-3/8" round devices. Nonconductive, noncorrosive, and impact resistant. Won't rust or fade. Scratch resistant. For use in wet/damp locations. Keyhole mounts, loosen the existing device screws and slide the cover over. Comes with adapter plates and pre-adhered gaskets. Wasp guard included to keep out unwanted pests. Lockable for security. UL Listed. For use in wet, damp or dry locations. Die cast aluminum construction. Powder coat finish. Self-closing lids assure weatherproof protection when the receptacle is not in use. One each 125 volt, 15 amp receptacle, single-gang box, installation hardware, cover and gasket included. 2.656" depth x 4.563" height x 2.813" width. cULus Listed, NEMA 3R. Boxed. For use in wet, damp or dry locations. Die cast aluminum construction. Powder coat finish. Self-closing lids assure weatherproof protection when the receptacle is not in use. One each 125 volt, 15 amp receptacle, single-gang box, installation hardware, cover and gasket included. 2.656" depth x 4.563" height x 2.813" width. cULus Listed, NEMA 3R. Boxed. For use in wet, damp or dry locations. Die cast aluminum construction. Powder coat finish. Self-closing lids assure weatherproof protection when the receptacle is not in use. One each 125 volt, 15 amp receptacle, single-gang box, installation hardware, cover and gasket included. 2.656" depth x 4.563" height x 2.813" width. cULus Listed, NEMA 3R. Boxed. High-impact polycarbonate construction, virtually indestructible, will not rust or corrode. 2-3/4 inch depth, 2 gang, pre-configured for GFCI with patented Knockout technology for alternate devices. 55 in 1 multiple combinations of duplex, GFCI, switch, and rounds: 1-1/4", 1-3/8", 1-9/16", 1-5/8", 1-11/16", 1-3/4, 2-1/8", 2-1/4", 2-7/16". Clear lid. Lockable design prevents tampering and accidental disconnects. Tri-lingual instructions. Includes attached gasket and mounting hardware. 5.54" x 5.43". Meets NEC requirements, UL Listed. NEMA 3R Rated. Shrink wrapped. 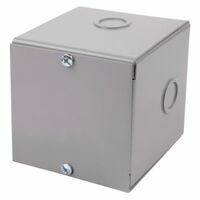 Outdoor electrical box, 4-1/2" x 4-1/2" x 2" deep with lugs. Seven 1/2" threaded outlets. 31.0 cubic inch capacity. For use outdoors in wet, damp or dry locations. Can be used as a weatherproof junction box, or as a housing for receptacles, switches, and GFCIs. Die cast aluminum construction. Reinforced connector outlets. Powder coat finish. Eight box mounting options with detachable lugs provided. Two closure plugs included. Ground screw installed in box. Internal threads and hubs comply with NEMA requirements. Hubs accept all threaded fittings and conduit. Multi-lingual instructions. UL Listed. NEMA 3R Rated. For use whenever weatherproof protection is required for an "on/off" type switch. Powder coat finish. Supplied with a switch unassembled to the cover - no need to purchase separate components. Includes installation hardware and multi-lingual instructions. UL Listed, CSA, NEMA 3R Rated. UV Resistant polycarbonate back, see-through cover and pre-mounted gasket protect devices inside from rain, sleet and snow without cracking or breaking. Non-corrosive and non-conductive. Snap-in inserts provide flexibility. Meets and exceeds UL outdoor low voltage landscape lighting requirements. Meets 1999 NEC Article 210-60 (b) for hotels and motels requiring covered receptacles behind beds, and 2002 NEC Article 406.8 (B) (1) for receptacles in damp or wet locations. Comes standard with three inserts (for a total of 16 different configurations): GFCI, duplex/toggle and toggle/four round in these sizes: 1.25" (31.75mm), 1.375" (34.925mm), 1.625" (41.275mm) and 1.75" (44.45mm). 3.25" deep x 6.445" x 5.575". Made of 16 gauge pre-galvanized sheet steel. Junction boxes for terminating power or communication conductors. For runs of conduit for power or communication conductors. 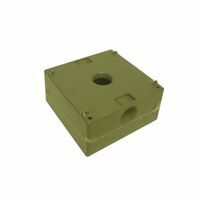 Service box for wiring devices or switch box for controlling wet location equipment. Drip shield top and smooth seamless sides, front and back. Knockouts are standard in bottom. No gasket required. Padlockable and provisions for meter seal are provided. A slip on reversible removable cover is securely fastened with screws located along bottom edge. Gray finish. UL Listed. Made of 16 gauge pre-galvanized sheet steel. Junction boxes for terminating power or communication conductors. For runs of conduit for power or communication conductors. 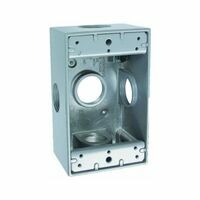 Service box for wiring devices or switch box for controlling wet location equipment. Drip shield top and smooth seamless sides, front and back. Knockouts are standard in bottom. No gasket required. Padlockable and provisions for meter seal are provided. A slip on reversible removable cover is securely fastened with screws located along bottom edge. Gray finish. UL Listed. Thomas & Betts Screw Cover Box, 3 Knockouts, 8 in Length, 8 in Width, 4 in Depth, NEMA 3R, Surface, Free Standing Mounting, Steel, Gray, Painted, UL Listed, CSA Certified, For Outdoor For use in wet, damp or dry locations. Kit is a complete weatherproof installation, includes weatherproof box, cover, GFCI receptacle and multi-lingual instructions. UL Listed. C/UL Compliant. Made of corrosion-resistant galvanized steel with a dark-green finish to match natural landscape. Comes pre-assembled for immediate installation right out of the box. The rolled edge hinged door allows cords to exit freely. Offers a padlock provision to help prevent unauthorized access. Features a 'while-in-use' cover for outdoor use. Rated for 120-volt. UL Listed. Includes installation hardware, gasket, and multi-lingual instructions. Weatherproof protection for outdoor receptacle. Powder coat finish for weather. Scratch resistance. Self-closing lid protects receptacle when not in use. C/UL/US NEMA 3R rated. Shrink wrapped. For use in wet, damp or dry locations. Kit is a complete weatherproof installation, includes weatherproof box, cover, GFCI receptacle and multi-lingual instructions. UL Listed. C/UL Compliant. Made of corrosion-resistant galvanized steel with a dark-green finish to match natural landscape. Comes pre-assembled for immediate installation right out of the box. The rolled edge hinged door allows cords to exit freely. Offers a padlock provision to help prevent unauthorized access. Features a 'while-in-use' cover for outdoor use. Rated for 120-volt. UL Listed. Made of corrosion-resistant galvanized steel with a dark-green finish to match natural landscape. Comes pre-assembled for immediate installation right out of the box. The rolled edge hinged door allows cords to exit freely. Offers a padlock provision to help prevent unauthorized access. Features a 'while-in-use' cover for outdoor use. Rated for 120-volt. UL Listed.